The Ash City – North End Youth Glacier Insulated Three-Layer Fleece Bonded Soft Shell Jacket with Detachable Hood is available in Sizes S-XL. It can be purchased in your choice of the following color: Black. SKU: AB-68010 Categories: Activewear, Fleece Jackets, Hooded Jackets, Jackets, Jackets, Polyester Jackets, Waterproof Jackets, Youth, Youth Active Wear, Youth Warmup Jackets, Youth Clothing, Youth Outerwear, Outerwear, Soft Shell Jackets, Fleece Clothing, Shop by Color, Navy Tags: fleece clothing, fleece jackets, hooded jackets, polyester jackets, soft shell jackets, waterproof jackets, youth, youth active, youth clothing, youth outerwear, youth warmup jackets, youth waterproof jackets Brands: Ash City. 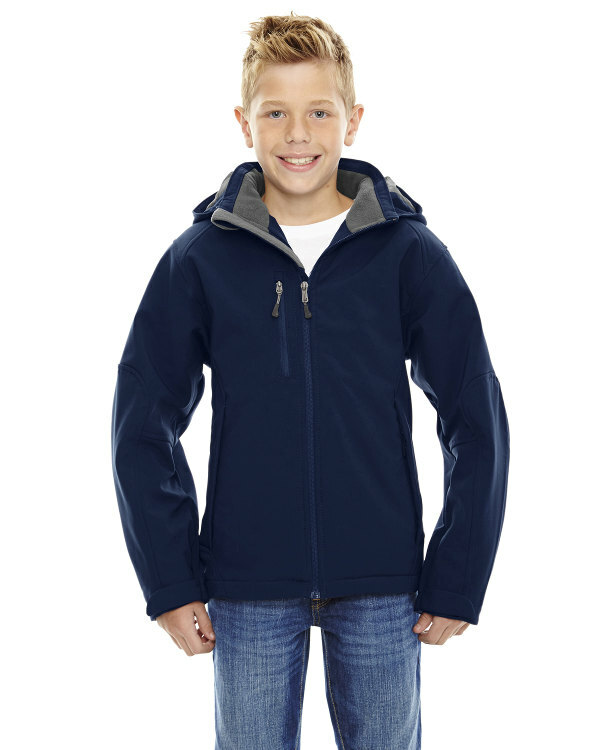 This Ash City – North End Youth Glacier Insulated Three-Layer Fleece Bonded Soft Shell Jacket with Detachable Hood is fully polyester taffeta with waterproof and is perfect for youth.